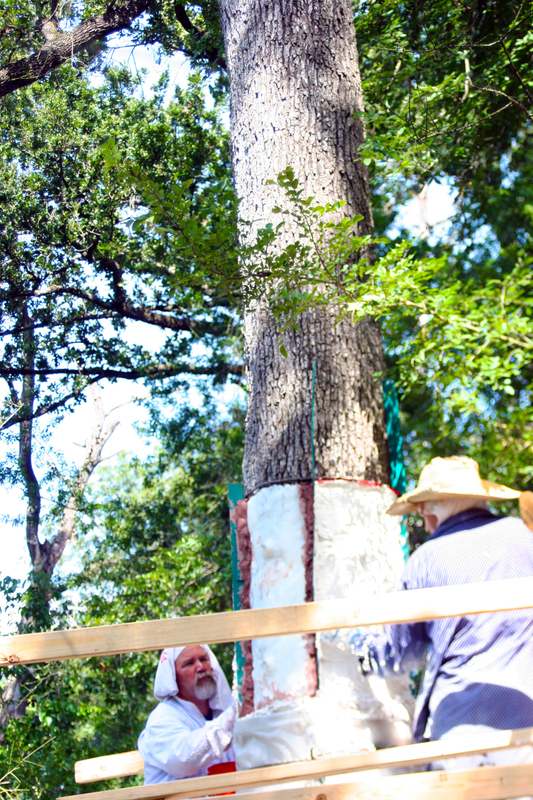 The Houston Museum of Natural Science conducting their tree cast on of the of Houston Arboretum’s post oak trees for their new exhibit. As you walked west of our Nature Center building on the Alice Brown Loop, the chemical smell of acetone could be detected in the summer air. As you approached one of our tall post oak trees off the trail you saw six or seven members of the Houston Museum of Natural Science’s exhibits team gently patting a thick, white substance on its bark. 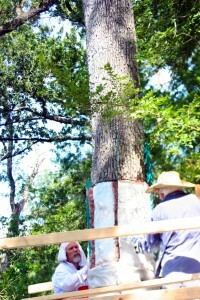 The tree casts cover the first 12′ of the tree trunk, requiring the team to build scaffolding. We are delighted because this meant the post oak tree in the picture above will be immortalized in a new permanent exhibit at the Houston Museum of Natural Science! 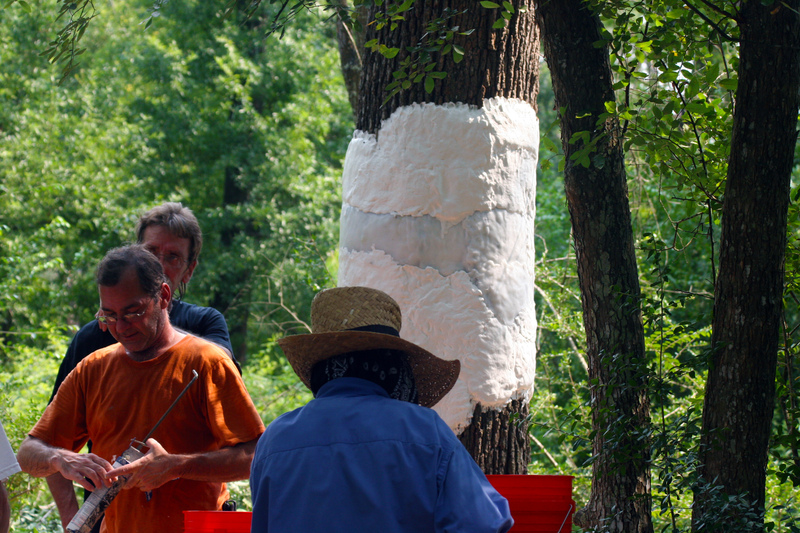 What you see in the picture is the museum’s exhibit design team creating a cast of the tree. From this cast they will be able to make an exact replica of the tree by making a mold. This post oak tree replica will be covering one of the I-Beams in a new exhibit at the Houston Museum of Natural Science. In addition to this tree they have also chosen a cypress tree right next to our parking lot. Fun fact: the cast is made of silicon rubber. 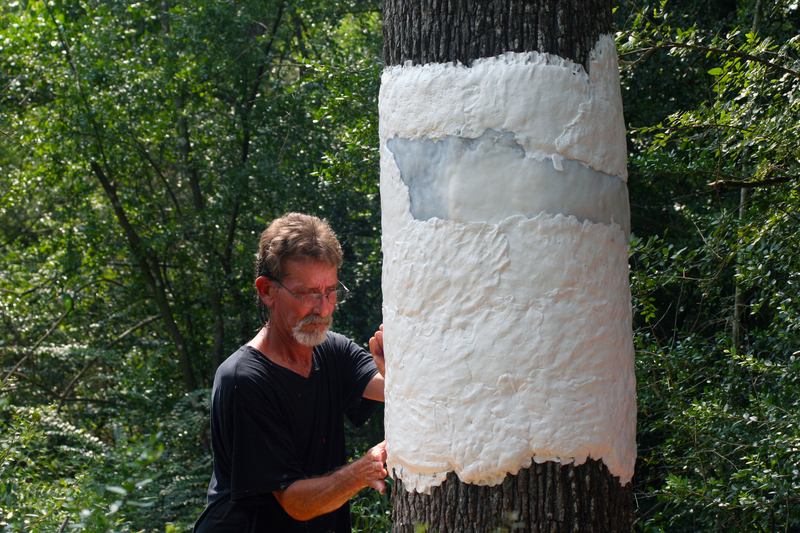 Once the silicon rubber dries they apply a layer of plaster in order for the rubber to maintain its shape when taken off the tree. The museum design team is casting the first 12′ of the tree trunks, requiring them to build scaffolding around the trees. When asked how they chose these specific trees the design team said they picked them based on the their width, height, and relative straightness. Since the I-Beams are a fixed width and perfectly straight, the trees need to be so as well to adequately cover the beam. Don’t worry, no trees were harmed during this casting process. The cast peels right off of the tree leaving the bark completely intact. The design team removed the debris and scaffolding after they completed the project, and you can’t even tell they were there. It looked like hard work in the sun but the new display will be worth the sweat!